A Perfect Pet for Peyton is a heart-warming birthday adventure the whole family will enjoy. Packed with beautiful full-color illustrations, this book offers children the chance to learn how we all give and receive love differently. Based on Dr. Gary Chapman's book The 5 Love Languages, the books contains illustrations with hidden details as well as a quiz to help children more fully understand their own personal love language. This is an all-around feel good book. The authors do a wonderful job exploring each love language within the book. The text is simple enough for my six year old to read independently, yet mature enough to hold my ten year olds's interest. The hidden details of the pictures allow even the younger children to get involved in the text. I liked it. I liked how their was gurls (girls). I liked it because, well, every page you are supposed to find at least one insect. I really like trying to find things. I also really liked how it was a theme park mixed with a pet store mixed with a petting zoo mixed with a museum mixed with a birthday palace. I thought the book was really good because it was educational but it wasn't boring. I especially liked how Peyton didn't think he was going to get a pet but then at the end he got the perfect pet and was really happy. I liked how it was by Gary Chapman and the man who owned the pet palace was Mr. Chapman. I liked the parts where they are in the buildings and by the map and they are having their cake and riding the roller coaster. I also really like the dinosaur rooms. 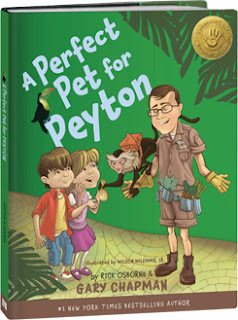 You can buy A Perfect Pet for Peyton at several on-line retailers including amazon and Barnes & Noble. List price for this book is $16.99 for a hardcover. Want to win a copy for free? Simply leave a comment on this post and I will choose a winner on Monday April 2. It's that simple! This book looks great - thanks for the giveaway! Thanks so much for reviewing this book I illustrated. So glad that you enjoyed it!